Here are some recent reviews from participants of The Work 101 course that just finished on October 20. Join us in January for the next course before it fills up. “This course was a great way for me to get clear about actually how to do The Work properly. Todd explains the technicalities of The Work and how to make sure you’re doing it properly in a technical way, for example making the turnarounds correctly. “But the best knowledge I got was starting to learn how to be clear about doing The Work without motives and trying to use it to manipulate or change myself. I also got a lot more confident in my ability to do The Work, which I hadn’t been able to trust myself with before. “There are so many nuances of The Work that get covered in the course and it gives such a clear and solid look at what The Work is and how to do it. What takes it to the next level is Todd’s presence and involvement, giving comments on your work and answering questions. “I have been doing the Work in fits and starts over the last 10 years. Whenever I did it, I experienced such a sense of clarity and joyfulness that I knew the Work would be an invaluable tool in my life. “With The Work 101, Todd has created a vehicle that enhanced my understanding and appreciation of the Work. His understanding of the Work through personal experience is clear for all to see. He is willing to share his experience and in that sharing he shines a light on the Work in a way that clarifies it beautifully for me. “The Work 101 deconstructs the steps of The Work of Byron Katie making it easily digestible and relevant. I felt supported at each and every step. Because one needs to do work every day on the course, it sets up a natural pattern of enquiry which will stay a part of my daily practice …it truly is meditation. “The platform of the Work 101 is easy to navigate and, if anything is unclear, it is easy to go back to review the process. Todd is always available and responsive to the participants so I felt he was right alongside me as I did the Work. “I appreciate Todd’s compassion, patience, clarity, precision and detailed thoughtful responses to our questions. He has expertise in documenting and teaching the processes of The Work. “The curriculum is thorough and includes video instruction as well as a pdf documents. All of the technical documents can be printed and kept for reference. “I got everything out of this course I needed to get the fire inside me to practice The Work really blazing. “After doing it on my own and listening to podcasts here and there I knew I wanted a detailed, structured, accountable forum to do The Work In. This is it! “Todd’s wealth of information and exercises are ideal for someone who is serious about learning the nitty gritty aspects of The Work. I felt supported, challenged and my knowledge increased 10-fold. “The Work 101 by Todd Smith is an excellent introduction to The Work. I’ve been doing the work for 7 years and found it so instructive. With all the tools offered—from seeing other people’s written work, writing your own work, partnering, videos, rapid replies to questions, etc.—it is well worth the time and money. “For me writing worksheets and writing turnarounds is the crux of The Work. As Katie says, all war belongs on paper. In this forum you truly learn how to write a Judge-Your-Neighbor Worksheet and how to get clear on the offense. You also learn how to do a One-Belief-at-a-Time Worksheet worksheet and learn about all the technical turnarounds possible. “I lucked out on finding and starting Todd’s class The Work 101 just a few weeks after having listened to Byron Katie’s “Loving What Is” on Audible. I found Todd’s website through an internet search and squeezed in right before the deadline for the start of the course. I am so grateful I was able to get in. “This is an amazing and thorough step-by-step exploration of The Work. It took me so much deeper into The Work than I could have guessed would be possible at the outset or that I know now I would have been able to do on my own. The Work 101 is all about the tools. For example, I love learning languages. But if I just buy a dictionary and try to learn a few words on my own, chances are I won’t get very far. When I want to learn a language, I sign-up for a course. The advantage of a course is that there’s a structure to the learning. I benefit from the experience of those who created this structure for me, instead of trying to figure it out on my own as I go. I can just sit back and go through the training and the learning happens almost by itself. Even children can do The Work. But just because something is simple, doesn’t mean that I will do it. Learning a language is simple enough for a child to do, but adults often are too busy. And just because it is simple doesn’t mean that I will get it easily. Sometimes the simplest things are the hardest to understand. So if you haven’t picked up The Work and run with it on your own, I invite you to join me in one of The Work 101 training courses that I offer online. The next one starts in April. And since then, I’ve run five courses, each one improving upon the last, thanks to all the great feedback I have received. As a result, the course is starting to become a really solid training program. I think you will find now that the course is capable of taking you from zero experience with The Work to self-sufficiency in just six weeks. It’s also a great way to go deeper with The Work if you are already experienced. For example, you’ll hone your skills at writing a really focused Judge-Your-Neighbor Worksheet. I just added a whole section on how to use a stressful emotion as a guide to identifying the main offense for a worksheet. You’ll become very familiar with how to find the technical turnarounds (to the self, to the other, and to the opposite). Many people have trouble with the turnaround to the other, so there’s extra emphasis on this. And there’s also lots of practice finding meaningful examples for the turnarounds. As you know, this is as much of an art as it is a skill. It is a meditation. You’ll get lots of practice with this kind of meditation during the course. During the course, you will be doing The Work four days a week for six weeks. There’s a lot of consistency in that. And I’ll be giving you feedback as you go. You’ll also get to watch how others are doing their work, and you can learn a lot from them. By the end of the course, you should have all the tools you need to do The Work on your own, and a momentum started for doing it on a regular basis. At that point, you’ll be welcome to join our ongoing practice group of The Work called Inquiry Circle, where many of us have been doing The Work consistently for about five years. If you’re interested in getting started with The Work, going deeper with it, or beginning a steady practice of it, The Work 101 is a great place to start. There are no set meeting times. Everything takes place on the Inquiry Circle forum which is open 24/7. There are videos to watch, articles to read, and written assignments to do. And once a week you will pair up with another participant in the course to do spoken work together. But don’t be fooled by the flexibility of the schedule. I am a strict trainer. If you want to participate, you’ll need to show up consistently. So plan on at least four hours per week to keep up with the assignments. If you do, you may find a new confidence growing in your ability to do The Work. I love work. I can watch it all day! Have You Ever Watched The Work? A great way to get a taste of The Work of Byron Katie is to watch some of the videos that Byron Katie has posted on YouTube. She currently has over 200 video recordings of her facilitating people as they do The Work on various topics. You’ll find videos on parenting, family, death and dying, relationships, fear, mental health and depression, money, body and health, business, and more. As you watch, you’ll see people doing The Work, answering the four questions and finding turnarounds and examples. You’ll see the range of stressful thoughts that you can question. And you can get ideas of how to come up with meaningful answers to the questions. As you watch, you’ll naturally find yourself identifying with some of the people doing The Work. Their work becomes your work as you watch. And their insights can often become your insights too. If you’re new to The Work or, even if you’ve been doing it for a long time, Katie’s videos can be helpful. As much as I love the videos, they are only a taste of The Work. There is no substitute for the power of finding your own insights as you do your own work. Each has it’s value. When I first started doing The Work ten years ago, I listened to audio recordings of Katie facilitating people. It really helped me to “get it.” Then, when I did my own work, I had a better idea of how to do it. Now, I rarely look at her videos, but whenever I do, I’m re-inspired by some insight that comes out. I invite you (and myself) to add watching these videos to your practice of The Work. You’ll find a long list of videos here on Byron Katie’s YouTube channel. in	Deepening The Work	,	Tools for Doing The Work	,	Videos	,	What Is The Work? There are many ways to enjoy a strawberry. And there are just as many ways to enjoy The Work as an ongoing practice. Many of you have been participating in Slow-Cook Inquiry, Steady Pace Inquiry, and Self-Paced Inquiry for years. And many of you have expressed interest in the new Partner-Pairing Program that I introduced a few months ago. Starting in January, all of these programs will be combined. I like to do The Work as an ongoing practice. And I like to offer creative ways for you to do your work on an ongoing basis too. In my experience, The Work is most powerful when used slowly over time. Not only does the practice deepen over time, but with an ongoing practice I am able to chip away slowly at my stressful thinking. It is never overwhelming that way, and I put less pressure on myself as I work. I just keep showing up and doing my work. Occasionally I look back and notice that issues that used to be big issues for me no longer bother me. That’s the power of a steady practice of The Work over time. A group is like a magnet. Once I join a group that I want to be with, I have a double pull to do my work. I have the pull from The Work itself—my motivation to find peace. But I also have an additional pull from the group itself. I want to move with the group. I don’t want to let the group down. And I want to learn from what others are working too. So the pull is strong, even with a busy life, to keep showing up to do The Work. And that’s how, over the past 3-4 years, a lot of work has been done in the Slow-Cook Inquiry, Steady Pace Inquiry, and Self-Paced Inquiry groups. This new combined “Inquiry Circle” group will have options for working at the Slow-Cook Inquiry pace, or at the Steady Pace Inquiry pace, or at the Self-Paced Inquiry pace. And you will be able to switch and change your pace as you like. Also, you will now be able to take advantage of partner pairing with others who want to do The Work in spoken form. In fact, you can do a combination of written and spoken practice in this new Inquiry Circle. The Work 101 course will be integrated into the Inquiry Circle forum. New participants in The Work 101 course will now be able to see other more experienced participants doing their work in the forum. And more experienced participants will be able to review any new material from The Work 101. It will be one big, open group, with many options for doing your work. And I’m sure it will continue to evolve and change over time. The cost will be $50/month. Billing will be on the first of every month. You can always skip a month if you are traveling or busy. And if you are not satisfied, you can discontinue at any time. The doors will open for new participants once a month. If you’re thinking about starting up The Work in earnest in the new year, please join us. Doing The Work in this group has been one of the few new year’s resolutions that I’ve actually been able to keep over the years. I hope this group will support you in doing your work as much as it has supported me in doing mine. Do You Prefer Writing The Work or Doing it with a Partner? Sailing can be done solo, or with others. Each way has its value. I like a little bit of both. But there are many ways to do it. You can sit down and answer the four questions, and find the turnarounds and examples for the turnarounds, alone with a pen and paper. I have fond memories of doing The Work this way at Turnaround House under the oak trees with the squirrels and the birds. And if you like to do The Work alone (but also with others) you can participate in one of my online forums where we write The Work every day but share it with each other: Slow-Cook Inquiry, Steady Pace Inquiry, Self-Paced Inquiry. I love doing The Work this way because I get to write it at my own pace, but I share it with others in the forum. I learn from them. And they help me to keep coming back to do my work every day. There’s nothing like the power of a group to support doing an ongoing practice. Partnering with another person and having them ask you the four questions, and supporting you to find the turnarounds and examples of the turnarounds, is another great way to do The Work. This is how I first started doing The Work. And having another person to meet with regularly really helped me to do my work. I made appointments, and I kept them, and The Work got done. Also, I learned a lot by working with other people. This is why I also offer a Partner-Pairing Program for doing The Work. This is an option if you prefer to do The Work verbally. In The Work 101 course this month, we practiced doing The Work in written form, as well as paired with partners. Here are some of the experiences people had. It’s clear how some people really prefer writing and others really prefer speaking. We meet for three weeks, starting July 5. You’ll get plenty of opportunity to do The Work in written form as well as with a partner. This course is not just for people who are new to The Work, but is a great refresher course as well. In this course, we go over all the elements of doing The Work so that you can get the most out of it when you do it on your own. The Work 101 is also a prerequisite for participating in my ongoing practice groups. Learn more about The Work 101 $9 here. Improve your ability to use the tools. The first is a three-week online course in The Work. I call it “The Work 101.” The second is an ongoing program for doing The Work with a partner every day, or every week. Let’s look at these two programs in more detail. This course is now a prerequisite for all of my other programs. Even if you are not new to The Work, this course will support you to go deeper in your work. And if you are new to The Work, it will will cover everything you need to know to use this simple, yet powerful tool. I will be conducting the course by webinar/phone connection. We will have three 90-minute sessions and one 30-minute session over the course of three weeks. There will also be homework partnering and other assignments for you to do. I will also be providing a number of handouts to support you in doing your work, including how to identify stressful thoughts to work, how to find turnarounds, where to look for examples of turnarounds, and how to facilitate others in The Work. The first course will start on June 1st at 1 PM Eastern Time (New York). If you want to join Slow-Cook Inquiry, Steady Pace Inquiry, Self-Paced Inquiry, or the Partner-Pairing Program, you will need to complete The Work 101 first. What Is The Partner-Pairing Program? The Partner-Pairing Program is another way to do The Work on an ongoing basis. There will be regular webinar/phone connections every week or every day, depending on whether you are in the Weekly Partner-Pairing Program or the Daily Partner-Pairing Program. You call in and get paired with another participant on the call to do The Work. The Daily Partner-Pairing Program will work through a Judge-Your-Neighbor Worksheet every two weeks, questioning one stressful thought from the worksheet every day. This is just like Steady Pace Inquiry, but in spoken form instead of written form. The Weekly Partner-Pairing Program will work through a Judge-Your-Neighbor Worksheet every two months, questioning one stressful thought every week. This is the same overall pace as Slow-Cook Inquiry. The Partner-Pairing Program will start in July. If you are interested, please take the survey as to when is a good time to meet on a regular basis. As more people participate, we will be able to offer more and more time slots for calling in to do The Work. But for now, we’ll just pick one time per day that works for the most people. Put your vote in for the times that work best for you. Note: this program has now been combined with the Inquiry Circle ongoing practice group. You will find access to this program here. And that’s what I’d like to do with all of you. Using the Zoom teleconference service, we can now meet as if we were in one room together to do The Work. There were 17 of us in a Zoom video webinar last month from all over the globe. We could all see each other and do The Work together. So cool! As opposed to private sessions. In private sessions, you can work one-on-one with me. In open sessions, you can also work one-on-one with me but in a group setting using the Zoom meeting service. This allows us to learn from each other as we do our work. Sessions will be 30 minutes each. You bring a completed Judge-Your-Neighbor Worksheet to the call, and I will facilitate one or two volunteers to do The Work. You can also bring any questions. And you can bring any work that you have started on but got stuck on. The call will be recorded and made available for those who attend the call. Join us on Wednesday, March 16 from 9:30 – 10:30 AM Pacific Time. Please register to get the call-in details. in	Announcements	,	Deepening The Work	,	Sample Work	,	Teleconferences	,	Tools for Doing The Work	,	What Is The Work? 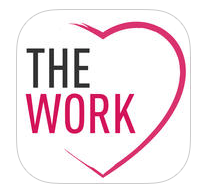 The Work App just got a major overhaul. This version really works for me. I just went through questioning a random belief (One-Belief-at-a-Time Worksheet) using the app. And then I used the app to write a Judge-Your-Neighbor Worksheet and started questioning line 1. It all worked seamlessly. I never had to leave the app. All the prompts I needed to fill in my worksheet and to do my work were contained in the app. Very cool to know I can pull out my phone anywhere to do The Work any time I want to. That means I can pull out my phone the moment I get triggered in some situation, write my worksheet right then, then maybe work a concept or two, and then save it to work more thoroughly later. Or I can pull out my phone when I’m waiting somewhere and carry on with some work I had started earlier. The only thing I wish it had was a way to export my work, or my worksheets, to another format (like emailing them to myself). But I can live without that feature. I believe it was a security issue that nixed this feature. I also notice that I cannot delete work that I’ve done from “My Work Journal” in the app. I’d love to have that control. But I can also see how saving everything is also good. No need to spend time organizing. More time to focus on doing my work. The app does allow me to edit my work. There is no explanation about “how to do The Work.” Just follow the simple directions. It will lead you through writing down your stressful thoughts, answering the four questions and any sub-questions, as well as finding turnarounds, and turnaround examples. The simplicity of it is what appeals to me the most. Will This Become My Main Way Of Doing The Work? I’m not that fast at typing with my thumbs on a phone. So I still prefer to write my work at my computer. And I really like the power of working in a group or with a partner. But I can guarantee that I’ll be using this app when I’m away from my desk. Can’t wait to write the next worksheet in the moment when it happens! I think Byron Katie’s team did a great job with this app. You can download the app from the iTunes store here for $1.39. It is designed for both iPhone and iPad. Or get the Android version.